Designs Produced from 9 to 1001 pieces, Exclusive and Customized Industrial Designs and More. The terms special edition, limited edition, deluxe edition or collector's edition, are used for various kinds of products, including but not limited to products related to the arts, such as books, prints, or recorded music and films, and also including cars and fine wine, among other products to highlight superior quality or rarity. A limited edition product is produced with restricted number of copies, Special edition product implies that there is extra material of some kind included within the package. Deluxe edition usually refers to higher quality variants, while collectors’ edition means the product is both special and limited. Submissions are accepted worldwide from designers and business in all industries. The A' Design Award for Limited Edition Products is not just an award, it is the indicator of quality and perfection in design and customization, the award is recognized worldwide and takes the attention of design oriented companies, professionals and interest groups. Winning the A' Award is a certificate of excellence for manufacturers. Having the A' Design Award attracts the eyes of design & arts oriented companies worldwide, winners will be able to find better and higher profile sales leads, get a step ahead in their commercial life. 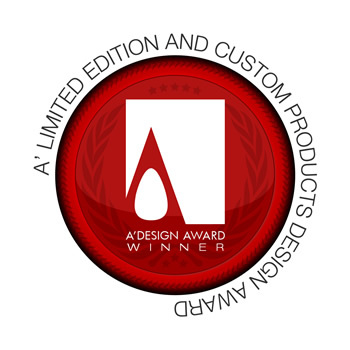 The winners of the A' Limited Edition and Custom Products Design Award are provided extensive and exclusive marketing and communication services to promote the success of winning the A' Award. Furthermore, award winning designs are published as a part of the best designs yearbook which is available worldwide, this book is furthermore distributed to the high-profile magazine editors, design oriented companies and relevant parties. The winning designs are also exhibited at our exhibition in Italy, and the best designs will be picked for the permanent exhibition. The winners appear on magazines, newspapers, webzines and many other publishing mediums. For concept stage projects, the A' Award is an early indicator of success. For realized designs, having the A' Award gives added value to your products and separates them from the rest of commoditized goods, it is an excuse to communicate your product to the media, a reason for press releases. Each winner design receives the trophy, published online and at our best designs book, receives a certificate and sticker templates to be attached to the products, the A' seal of design excellence is also included in the winners package, this seal is valid for the entire product lifecycle without yearly fees. The Jury is composed of both Academic and Professional participants worldwide, such as chief executive officers or head designers of companies and faculty heads or professors. In addition, the A' Award features the focus group jury, which is composed of ordinary people to normalize the scoring by eliminating the bias on aesthetics and form sections, the votes of Professional, Academic and the Focus Group are weighted to determine the final result. The Aim of the Limited Edition Award is to attract the attention of luxury and lifestyle design media, magazines, and industry leads to your business by creating publicity and dissemination. The Limited Edition Award helps to separate you from the rest of the actors in the your industrial sector by honoring your institution with a prestigious award. When submitting to the Limited Edition Design Competition keep in mind that your submission will be evaluated on multiple factors; i.e. your design is judged together with its sustainability, ease of application (installation or integration), and packaging. However, special attention will be given to the factors that make the design "Limited Edition"; i.e. additional features, special packaging and presentation are given extra credits and score. The best designs are considered for their degree of innovation, human factors, ease of implementation and realization, depthness of development, and technical properties such as choice of materials and ergonomics. The best limited edition products are considered for their graphics work, ease of application, and sustainability and special attention will be given to the packaging and features that makes the product distinct from the normal editions. Unlike some other design awards and competitions, you are not obliged to make any further fees for winning the Limited Edition Design award and every item listed in the winners benefits will be provided free of charge. Limited Design Award applicant products must be produced more than 9, less than 1001 pieces. Products that are produced less or more copies are excluded. Artworks or craft pieces are not accepted to this category; however single-base custom designs and other works shall be submitted to the Arts, Crafts & Ready Made design category. Nominated designs must be all industrially produced or producible; submissions are accepted from commissioned artists, designers, creative agencies and manufacturers; i.e. ready-made designs by other designers are not accepted. Award winners will be able to use a title that matches their nomination category: Such as "Limited Edition Products Design Award Winner". View previous period limited edition award winners here. Optional Image #3 1800 x 1800 pixels JPEG Showing the product in a setting where the product is utilized, or an action shot. Alternatively details of packaging and extra contents.